It’s not even August and Arsenal have signed four (yes, four!) players already as Arsene Wenger builds a squad capable of challenging for the Premier League. The Frenchman has splashed £60m so far this summer with Chile’s World Cup star Alexis Sanchez the most high profile of the new Gunners. 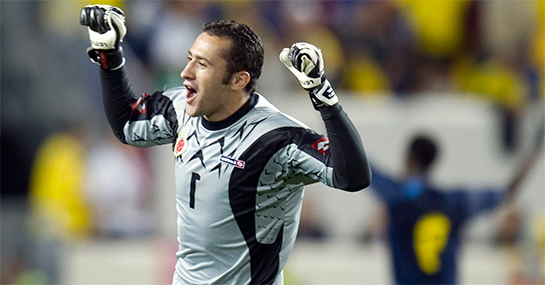 He has been joined in north London by French international Mathieu Debuchy and former Southampton star Calum Chambers but it is the signing of Colombian goalkeeper David Ospina which could prove to be Wenger’s shrewdest capture so far. With Lukas Fabianski leaving the Emirates Stadium for pastures new at Swansea, Arsenal were in the hunt for a goalkeeper who would provide stiff competition to Wojciech Szczesny and in Ospina they will certainly have that. Arsenal face Crystal Palace on the opening day of the season at the Emirates and are 10/11 to win to nil. But should the Gunners keep the visitors at bay, who will be collecting an early clean sheet? Wenger has already revealed Szczesny will start as his number one this season but has sent out a warning to the Pole by backing Ospina to challenge him all the way. “You know at the start Szczesny will be the No 1, then again it will be down to performances and, if Ospina shows that he is better, he will play,” the Arsenal manager said. And judging by the pair’s stats from last season, Ospina has a great chance of dislodging his new teammate from the starting goalkeeper berth at the Emirates. Playing for Nice, who finished 17th in Ligue 1, Ospina would have arguably been under much more pressure from opposition attacks but conceded just 25 goals to Szczesny’s 41. Ospina, who made 29 appearances last season, conceded just 0.86 goals per game in France with his save success rate up at 80.20% compared to Szczesny’s 1.11 and 73% for the Gunners. The Colombian, who successfully claimed more high balls into the box (12) than any other goalkeeper at the 2014 World Cup, also made on average 3.48 saves a game, while his Polish rival could only muster three stops per game for the Gunners in the Premier League. With the talented Ospina breathing down his neck expect improved performances from the Polish international, who kept the Eagles at bay at the Emirates Stadium last season in a 2-0 win, otherwise it could be a long season sitting on the bench for the former Legia Warsaw stopper.